I have just returned from a 2 week trip and wanted to load up the tracklogs (Where I've been) information into Basecamp. It looks like only the last 3 days are available. On investigation it appears to be a memory issue. It also looks like it is not possible to extend the memory for the tracklogs using an SD card. I can put the routes and waypoints stored into the card, but to use them I would have to reload them into memory anyway. Am I stuck or does anybody have a suggestion. I have searched extensively but can't find any information, and I can't be the first one to come across this issue. 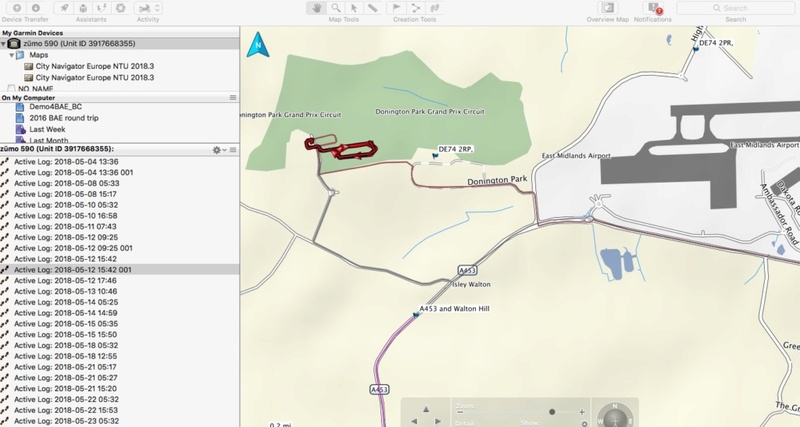 The Garmin Zumo definitely stores more than 3 days worth of track log. 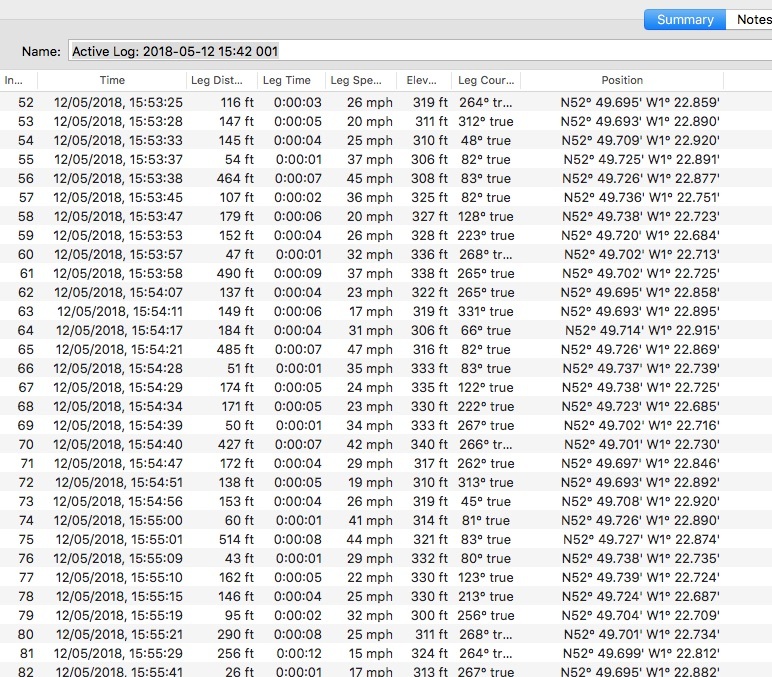 I have had a look at mine and I have activity logs going back to 14 Apr (the date I had it exchanged with Garmin as the old one went blank screen on me) right though to 29 Jun - that is 51 different riding dates. 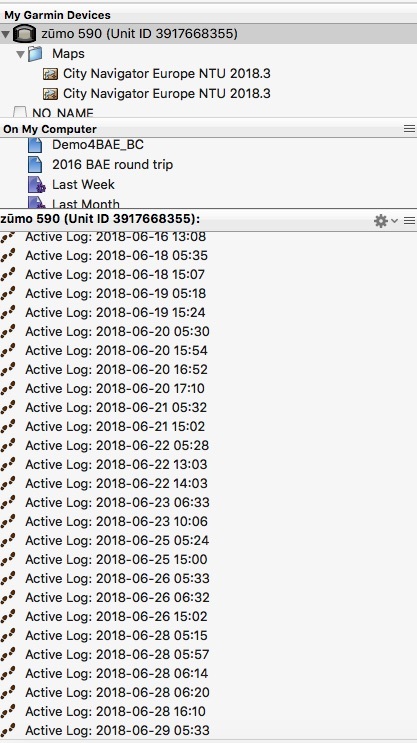 Click on the Zumo icon at the top left of the screen (just below where it says "My Garmin Devices"
You should then see a whole load of "Active Log" entries in the window at the bottom of the left side of the screen. 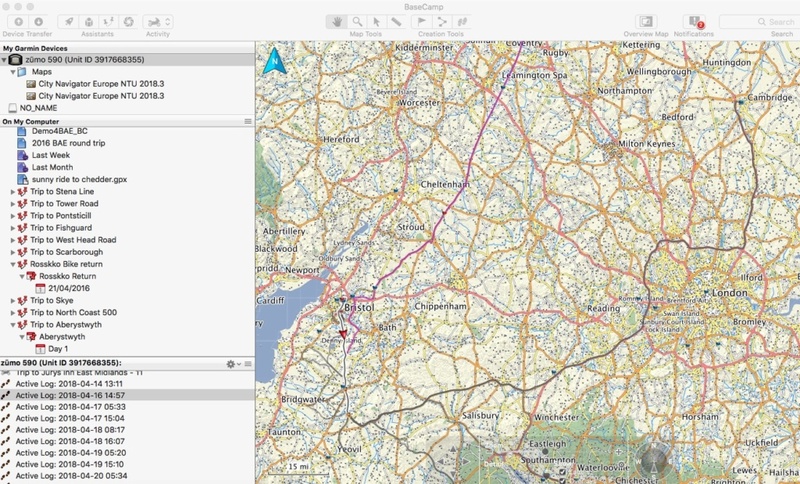 Click on any of these individually or a group together and you will see you route on the map to the right. Hope this helps...mine is a Zumo 590 by the way and all this info is stored on the internal memory card. I have used about 50% of the 15GB space (I have all of UK & Ireland Maps as well as all of Australia)! The only thing I have on the SD card is my music collection and that still has 27GB space remaining!!!! But by going through windows file explorer, I found that the zumo had archived the remainder of the trip in a gpx file (in an archive directory). It appears to do this automatically when it runs low on space. I was able to import the archive file into BaseCamp which then read it as the remaining tracklog. I then cleared out all the archives etc. in the Zumo, and found another trick from 'tinternet. In file explorer, copy (backup) all the voice files on the zumo and delete all the ones you don't need (I kept the three English speaking ones) . This frees up a large amount of additional space.